There’s a post on Sean and Nicci’s site about the family Morris Traveller. 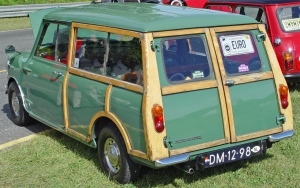 Well, the earliest car I can remember was also, I think, half-timbered. When when we first came back from Africa in 1970 my mother had a Mini Traveller. I was three years old at the time, but amazingly, I can remember its registration number: TBB 571G. I remember that mini traveller!